Horizontal Cartridge Filter with Quick Release Closure, ANSI 900#. See Filter Vessels page for more details. Horizontal Filter Separator Supplied to B.P. weighing in at over 20 Tonnes. See Filter Separators page for more details. Typical Horizontal 'Bandlock 2' Closure Manufactured by G.D. Engineering. Barton Firtop Engineering Co Ltd utilise 'Bandlock 2' Closures supplied by GD Engineering on filter vessels that require Safe Quick release access to internals where high pressure is involved. The GD Bandlock 2 closure provides horizontal or vertical access to Filters, Coalescers, Separaters or any pressure vessel in seconds. The proven locking band mechanism, which gives the range its name, is a duplex stainless steel conical thrust ring fitted between the door and neck to transmit loads uniformly to the full 360 degree circumference of the neck. 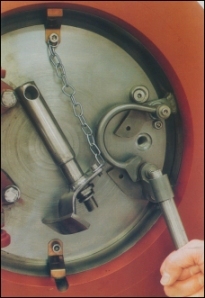 A hand operated pressure warning device - integrated into the mechanism - prevents the door being unlocked until confirmation is available that the pressure has been relieved. A non-bleed type pressure warning device can be provided in toxic or sour service. Secondary safety features including key and valve interlocks can also be fitted. Safety is therefore inherent in the BANDLOCK 2. The complete visibility of the locking band at all times satisfies design code requirements and the Operator can actually see that the door is securely closed. The servo acting double edged lip seal energises at zero pressure. it is housed in the door face for protection, long life and is easily fitted without tools. The one piece moulding is available in a range of elastomers and at the highest pressure, incorporates a stainless steel spring to prevent extrusion and provide a full vacuum capability.